Epcot is one of my favorites of the 4 parks at Disney World. Hollywood Studios is a favorite too, and those were the two that I chose to visit on this trip. I drove up on Saturday and spent Saturday afternoon and evening at Hollywood Studios. I got to check out the new Toy Story Land, which is a lot of fun. I went to an After Hours event at Hollywood Studios, which, if you’ve considered doing one of these, it’s definitely worth the money! You get a few less hours at the park than you would if you’d bought a normal day pass, but you definitely get a lot more accomplished. All of the lines were very short, and the park looked empty in a lot of places. I’ve never seen it quite like that. I’m glad I did it. It gave me a chance to ride all of the rides, and even the new Slinky Dog ride twice. Saturday I decided ahead of time that I was going to spend the day at Epcot. January is the beginning of the International Festival of the Arts there. Epcot has a few different festivals throughout the year, including the International Food & Wine Festival and the Flower and Garden Festival. It’s always fun to go during one of these because they always have little food carts with special items that you wouldn’t normally be able to get on a normal day there. 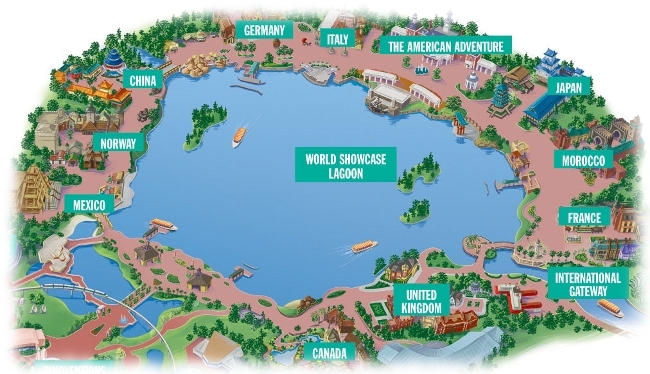 Now, if you’ve been to Epcot, you know that their World Showcase is mapped out around a lake and has areas that represent 11 different countries – Mexico, Norway, China, Germany, Italy, America, Japan, Morocco, France, United Kingdom, and Canada. Each “country” has shops, restaurants, and stands that sell food, drinks, and items that are supposed to represent each of these countries. It can get a little cliché at times, but overall, it’s a fun experience. Generally when I’m there, I walk around the lake and just eat or drink whatever strikes my fancy. But this day, I had decided I was going to eat or drink something in each of the 11 countries. I wanted to hit them all! I’d never really done that before. 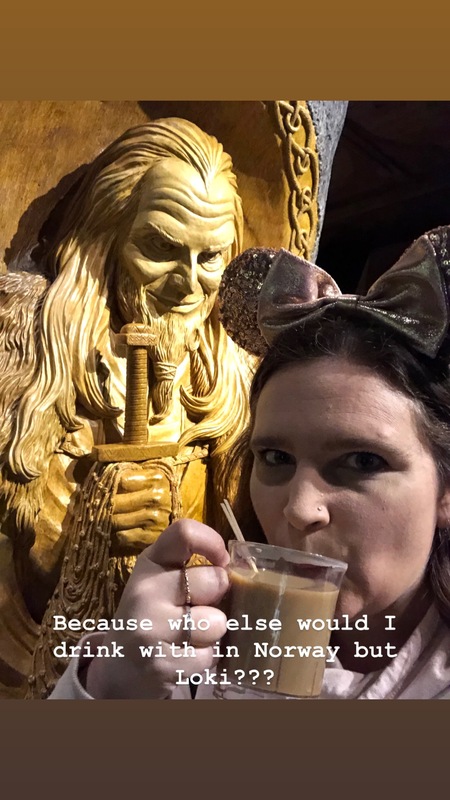 Oh, and of course I had to document it with pictures on my Instagram and Facebook stories as well, so people could follow along. Before I left, I did a poll on Twitter and asked people if I should start in Mexico or Canada. The overwhelming majority said Mexico, so that’s where I started. 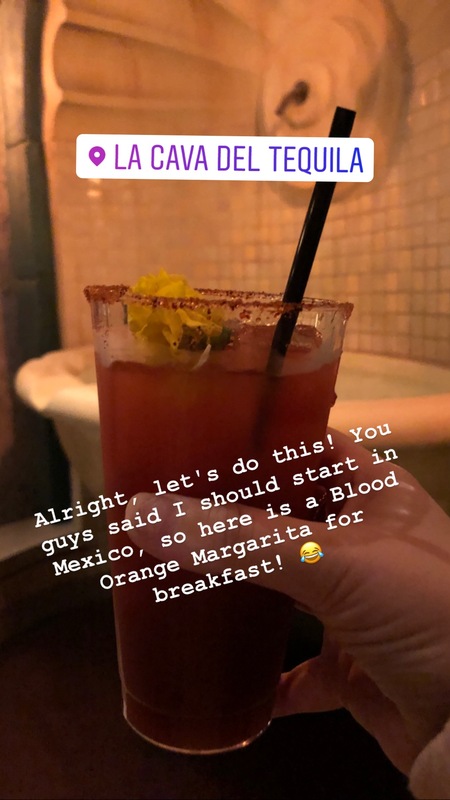 So, margaritas for breakfast! I ordered a Blood Orange Margarita from La Cava del Tequila inside of the Mexico pavilion. It was tasty, and I’d never tried anything from there before. In fact, a lot of the food and drinks I had were new to me, which made this an even more fun experience. My next stop on my “world tour” was Norway. Norway is a great place to have breakfast. They have a bakery there with a lot of goodies, and what I ordered here was something I’d tried before – Viking Coffee! It is flavored with coffee liqueur and Bailey’s Irish cream. It was a bit windy and cool in Florida that day, so this really hit the spot. And of course, I had to go check out their Norse mythology display and visit Loki while I was there. Ok, two drinks in and I should probably get some food in my next country, which was China. Perfect! Who doesn’t love Chinese food? I picked out something new to try at this one too, so I actually ended up visiting one of the Arts Festival carts, since all the quick service restaurant in China had was really just your standard Chinese restaurant fare, nothing that really made me excited. 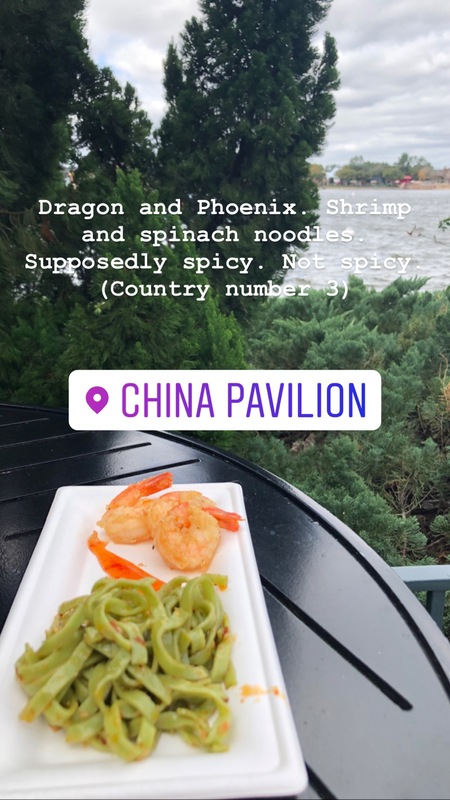 So instead I ordered the Dragon and Phoenix, a small portion of shrimp with spinach noodles. I know when I ordered it, I saw the word “spicy” in there somewhere, but honestly… it really wasn’t very spicy. Kind of disappointing, but still tasty, especially the spinach noodles. Good start to my food for the day. Next up after China was Germany! Germany always makes me think of our friend Axel who lives there and who we’ve visited there. I’ve been to Germany a few times now, and I’ve had most of your standard German fare IN Germany, so it was hard for me to think ordering something like a “German pretzel” in Epcot was going to even come close to the actual German pretzel the size of my head that I had at Oktoberfest in Munich. So I tried to find something a bit different. And I did. 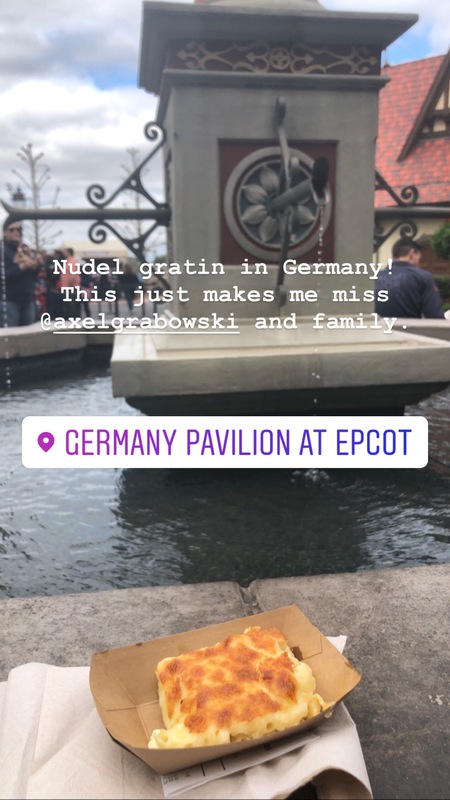 The quick service restaurant in the Germany pavilion had something called Nudel Gratin, which, essentially, was mac and cheese. And it doesn’t look like much in the picture, but it was actually very tasty mac and cheese! If you’re looking for something a bit different in Germany at Epcot, this makes a great snack or a side. Another new item for me, and I enjoyed it quite a bit. Would recommend! Next after Germany came Italy. Italy seems like a good place for the next drink, right? Let’s see what they have. At a stand over by the replica of Trevi Fountain (which seemed really small compared to the real Trevi Fountain in Rome, which I have actually been to), I found some limoncello. This was also something new I’d never tried, either in Italy or in Epcot. But it sounded good, and it was. I don’t think this stand is even listed on the map on the Disney World app, as it didn’t have a huge selection. But I was looking for a quick way to get a good drink, and I found it. It was the perfect thing to enjoy sitting by the fountain. Alright, I’m halfway there! America is the halfway point at the World Showcase. It’s country number 6 no matter which way you are going around the lake, and it sits right in the middle. It’s a good spot to sit for a minute and admire that famous “golf ball” on the other side of the lake. Now, here’s where I kind of took a hit for the people that were following me. 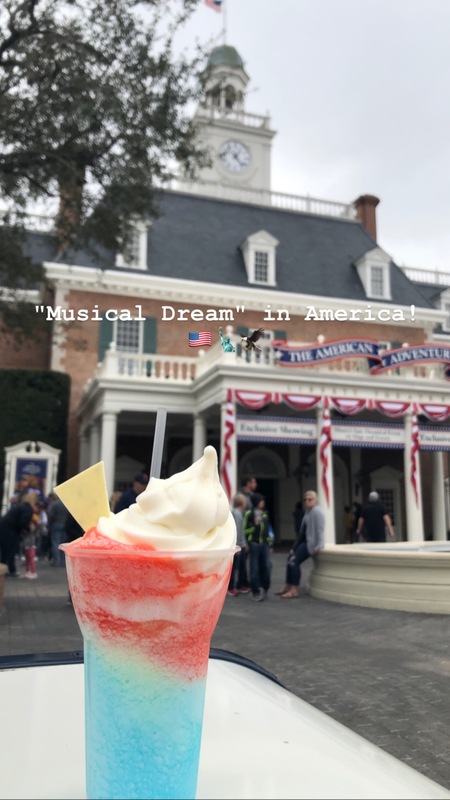 I checked out the food and drinks in the America pavilion and felt like I HAD to get something that would look very “American” to post on my story. So I got the Musical Dream, which was a special offering due to the Arts Festival. It was layered strawberry, lemonade, and blue raspberry slushy with vanilla ice cream and white chocolate. Looks pretty, doesn’t it? But it wasn’t what I really wanted. They had a hot chocolate you could get with Red Stag black cherry bourbon that sounded like it would hit the spot a lot better in those windy conditions. But alas… I took a sacrifice for the ‘gram. The slushy would have actually been pretty good on a normal hot Orlando day (aside from the lack of alcohol in it, that is). Next up, Japan! Japan also had some interesting offerings for the Arts Festival, including what I chose – a sushi donut. I know I have your interest piqued now, am I right? And yes, it was unique and pretty. But taste wise, it was actually pretty boring. 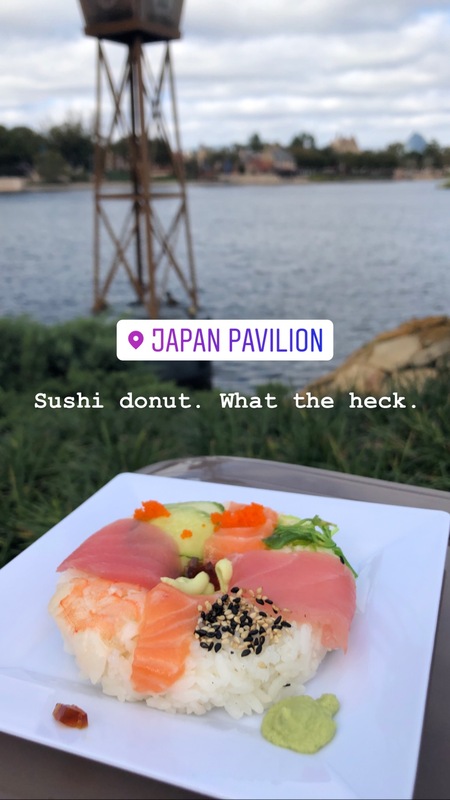 It was a ring of rice with some sushi on top, and it was pretty standard varieties of sushi – tuna, salmon, shrimp, etc. It was nice to take a picture of, but definitely not the most impressive thing I ate that day. After Japan came Morocco. I actually spent some time wandering around the Morocco pavilion because it’s honestly just so cool looking. 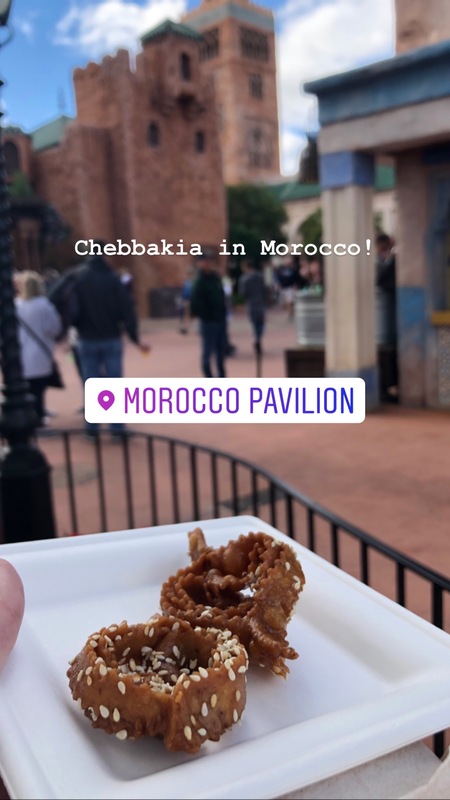 Morocco is one of only 3 countries at the World Showcase that I haven’t been to for real, and I’m actually planning to visit there for the first time later this year. So seeing all of the architecture in the pavilion really just got me excited for that visit. Also, there was plenty of interesting food to choose from here. I chose something called Chebbakia, which was hand-twisted strips of fried dough coated with honey, rosewater, and sesame seeds. It was a good dessert that wasn’t too sweet. It had a bit of crunch to it, but wasn’t hard… more like a wafer consistency. It was tasty, though, and again, I would recommend this one for a sweet snack. The next country was France. You almost have to get something wine-related in France. Although the Brie in a bread bowl sounded good too, but I was ready for another drink. 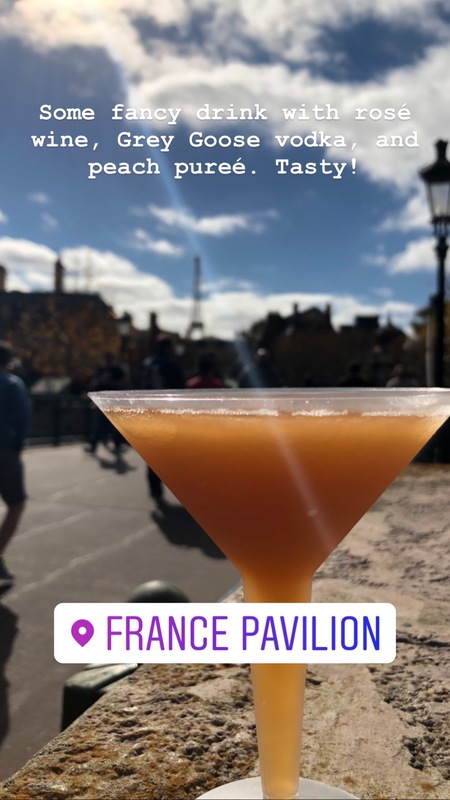 Epcot has so many good cocktails! The one I chose in France was called a Frosé, and consisted of rosé wine with Grey Goose vodka and peach purée. It was tasty, but not super impressive looking, which made it seem weird when SO MANY people stopped me to ask me about my drink and where I got it. I’m not sure what it was about that drink, but everyone seemed to be interested in it. I met up with my friend Steph and her hubby Chris at the France pavilion and they walked the rest of the way “around the world” with me, and even they thought it was weird that so many people asked about it. Almost there… just two countries left! The next one is my favorite actual country I’ve been to – the United Kingdom! If I’d been super hungry here, I would have definitely gotten fish and chips. But I was actually getting a bit full at that point, and I’d had a few sugary drinks, so I didn’t eat much of the food I chose, which was Victoria sponge cake filled with jam and buttercream. Don’t get me wrong, it was tasty, but very sweet and sugary and I already had a sugar high going on, so I couldn’t eat too much. 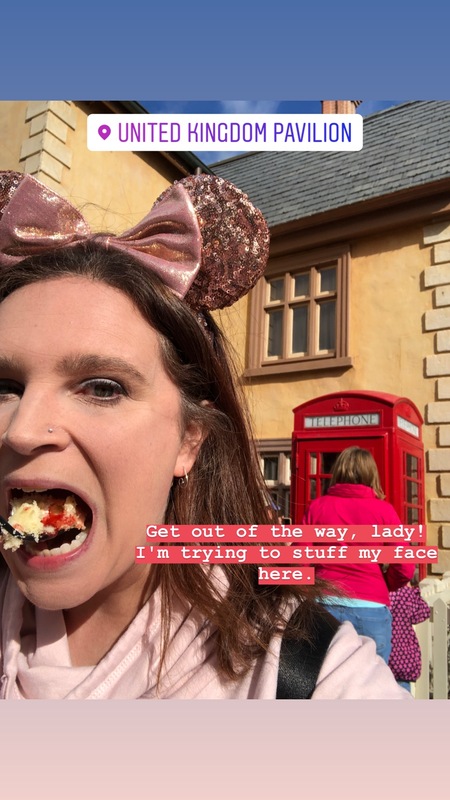 But definitely try it if you’re looking for a good dessert to try at the United Kingdom pavilion. Last stop – Canada! This one left me somewhat disappointed. I hadn’t had any beer yet, and Canada has a really good brewery called Unibroue. They have some really tasty brews, and I know at one of the festivals I’d been to at Epcot they had a flight of 3 Canadian beers that I thought were all from Unibroue. But I couldn’t find it this time. It might have just been there for the Food & Wine Festival. 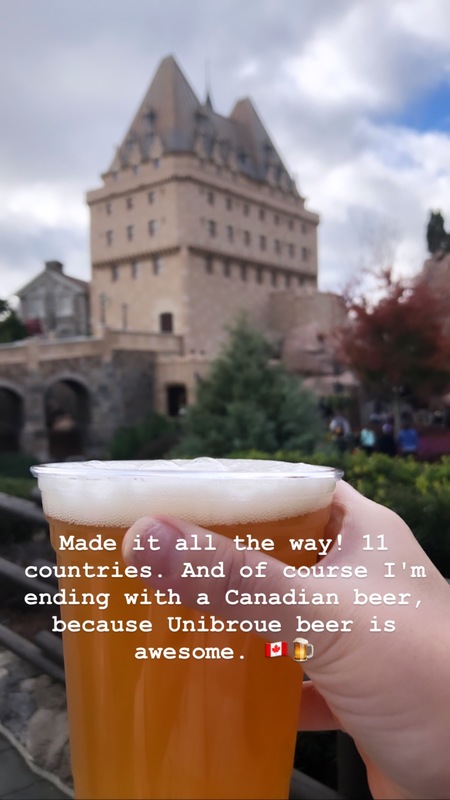 And I could only find one beer cart in the Canada pavilion, but they did have a Unibroue beer, so that’s what I ordered. Sadly, it’s not one of Unibroue’s best, but I did get to end on a decent craft beer. Hooray, I made it “around the world” and got something in every country. I did throw in one last bonus item, mostly for my friend Theresa who loves churros and had requested that churros be a part of this trip. 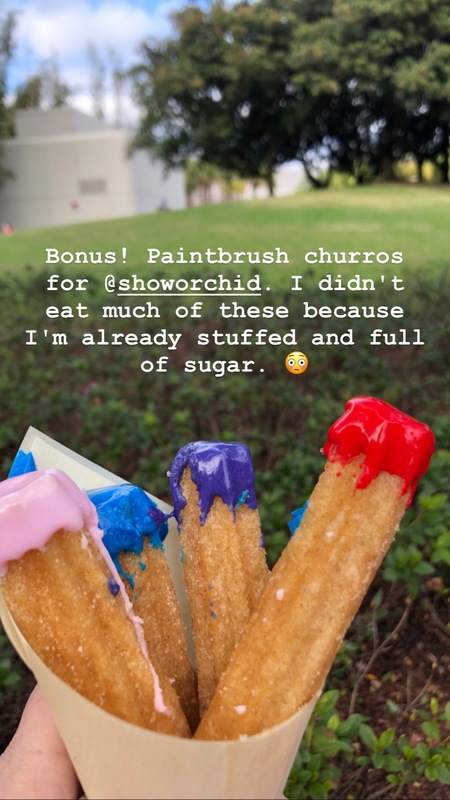 As a part of the Arts Festival, there was a stand that had some “painted churros” that were dipped in colored white chocolate to look kind of like paintbrushes. So that’s where I headed. They were pretty and made for a nice photo, but at this point I was so full! I only mostly ate off the ends of the churros. They were pretty much just basic churros other than that, so I don’t feel like I missed much. So there you have it. 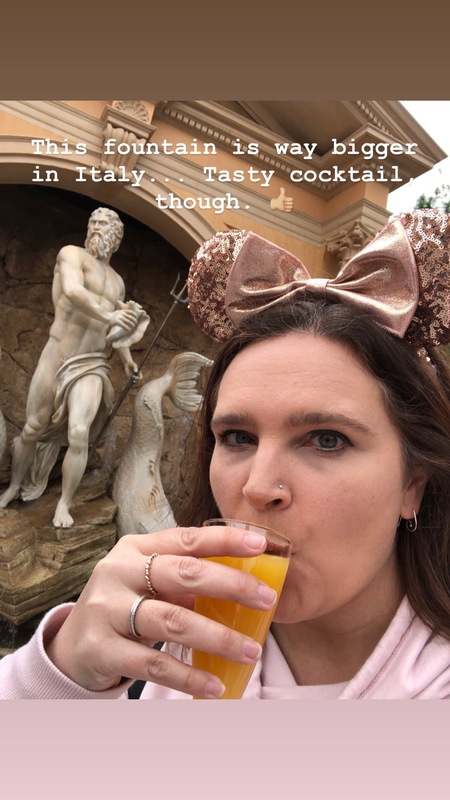 A photo documentary of my trip around the World Showcase at Epcot, eating or drinking something in every country. It was quite fun, and I’d highly recommend. If you’d like to see all the pictures from my story that day, I have it highlighted on my Instagram page or you can check out the gallery below. Enjoy!